DIGICEL and Usain Bolt have been partners since 2004. 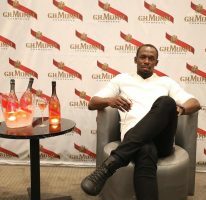 Usain has featured in all of the company’s major campaigns during that period and since copping the Olympic and World Championships records and titles, both Brands have combined well to impact on the loves of people in the Caribbean region. This time, Usain and Digicel took their campaign to the French West Indies islands, Martinique and Guadeloupe. Both islands have almost identical population (400,000 people) and both have intentions of developing their sport and more specifically track and field programmes. First stop was in Martinique where Usain visited the Digicel staff who were too happy to see him. In the middle of a brief shower of rain. Bolt with his usual charismatic self had a ‘ball’ taking pictures and greeting them as he explained the history with Digicel. Bolt was then featured in the number one television station and state-owned. He was interviewed in the prime time news hour from 7:00 – 8:00 p.m. and was the major interview guest. 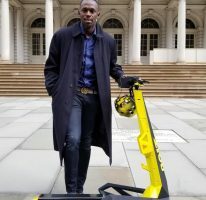 Bolt got off to an early start on Saturday morning where he shot some public service announcements (to be aired on MTV and VH1 soon). He then went off to the National Stadium, a place where he ran a 400 metres some years ago and met with track and field officials and athletes. He was presented with special gifts, including the medal of the city award. Bolt watched a track meet which featured Special Olympics wheelchair races, flat races and regular races with young children. Usain thanked the spectators and praised the athletes for their efforts. Bolt went to the main Stadium in Guadeloupe where he met with the island’s top 25 athletes some of whom were 100 and 200 metres, but a few long jumpers and shot putters. He caught up with old pal Remy Arnaud who had a short stint with Racers Track Club in Jamaica. Bolt then watched a few races and presented special Digicel packages to select winners. Only Usain can out do himself and after signing flyers with his picture on…went over to spectators and handed them out. He climbed up on the fence to hand out on both sides of the Grandstand. Bolt was back in Prime Time, this time on the major news cast on Guadeloupe ere 1….between 7:00 – 8:00 p.m. news hour. His segment was preceded by coverage of his entry to the island and visit to the Stadium. Bolt was then the main guest at the Digicel VIP party at Hotel de la Vielle. 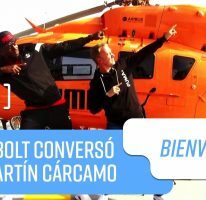 Bolt danced to the Guadeloupe (ZOOT) like he lived there and danced to the French version of the Electric Slide. He just never fails to entertain.